areas. Its name is translated as "robber of the heart." 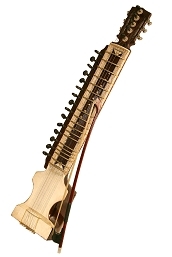 The esraj is found in the east and central areas, particularly Bengal, as well as Bangladesh, and it is used in a somewhat wider variety of musical styles than is the dilruba. The Dilruba originates from the Taus and some argue is the work of the 10th Sikh Guru, Guru Gobind Singh, whilst that of the Taus was the work of Guru Hargobind (the sixth guru of the Sikhs). The Dilruba was then produced to replace the previously heavy instrument (the Taus). This attempt was intended to 'scale down' the Taus into what is now known to be the Dilruba. This made it more convenient for the Sikh army to carry the instrument on horseback. played with a bow, with the other hand moving along the strings above the frets. The player may slide the note up or down to achieve the portamento, or meend, characteristic of Indian music.